The recent plunge in the stock market has taken a toll on Berkshire Hathaway Inc.'s investment portfolio. Most insurance companies have a higher percentage of investable assets in bonds when compared to other asset classes. Bonds have historically been less vulnerable to large market swings and provide a more predictable cash flow, which helps insurers plan to have enough cash available to meet their claim liabilities. However, Berkshire's property and casualty subsidiaries do not have a typical insurance company investment portfolio: Compared to other large U.S. P&C insurers, Berkshire in aggregate had the highest concentration of holdings in common stock and cash or cash equivalents. 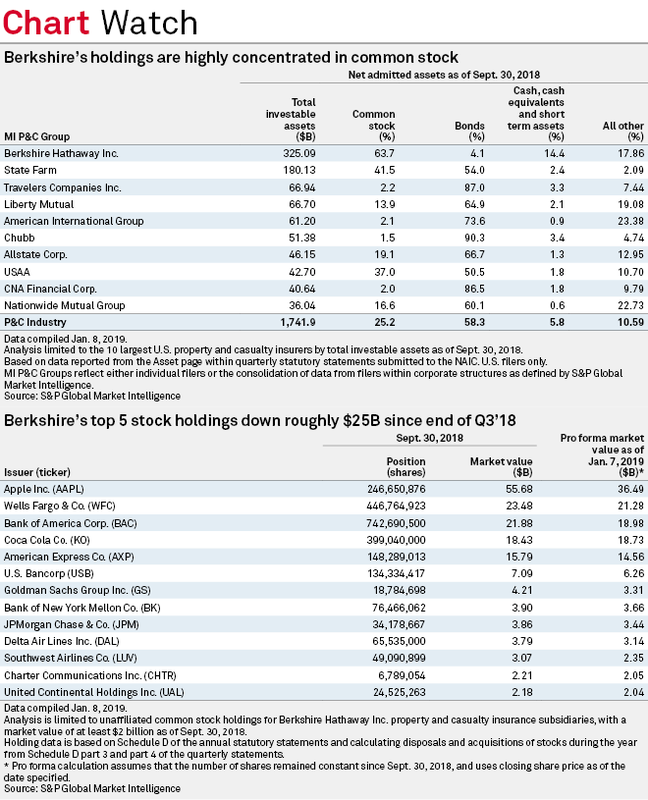 Common stock accounted for almost 64% of Berkshire's total investable assets at the end of the third quarter of 2018, a little over 22 percentage points higher than State Farm Mutual Automobile Insurance Co. subsidiaries. As of market close Jan. 7, the value of four of Berkshire's five largest holdings has decreased since Sept. 30. On a cumulative pro forma basis, investments in Apple Inc., Wells Fargo & Co., Bank of America Corp., and American Express Co. are down just over $25 billion during that time, with Apple's 34% drop wiping out $19.2 billion of Berkshire market value. The lone bright spot, Coca-Cola Co., is up $300 million over that period. But although the recent stock market volatility will exact a greater toll on Berkshire's balance sheet than those of its peers, its combined P&C subsidiaries had almost $187 billion in policyholder surplus at the end of the third quarter of 2018. Policyholder surplus is the difference between an insurer's assets and liabilities and is one metric used in measuring financial strength. In the event of higher-than-expected claims, the surplus may be used to pay for liabilities in excess of reserves and any reinsurance it may have. The National Association of Insurance Commissioners has developed an Insurance Regulatory Information System ratio to help state regulators determine the solidity of P&C insurers. A range of "usual" ratios is provided for 13 distinct measures, such as premiums written as a percentage of surplus and rates of growth in policyholders' surplus. In the case of net premiums written to surplus, the greater the ratio, the higher the risk the insurer bears in relation to its surplus. Any figure above 300% would be considered unusual. As of the third quarter of 2018, Berkshire's ratio was 30%, compared to 81% for the broader P&C industry. All else being equal, the $25 billion decrease in the value of Berkshire's largest five stock holdings represents only 13% of its combined policyholder surplus. S&P Global Market Intelligence provide multiple templates to assist in analyzing an insurer's investment portfolio. Click here for a template that allows you to search for U.S. insurance company exposure to individual securities or securities issuers by CUSIP. Click here for a template for a detailed profile of investment subtotals and individual holdings for a single insurance company or group. Also contains a summary of bond investments as found in Sch D, Part 1A of the annual statement.